I can not understand it, that we people have to eat everyday. And I can not understand how comes that I am hungry all the time keeping my weight since years ;) In the past days I cooked some dishes which took me just a few minutes to prepare. I love casseroles. 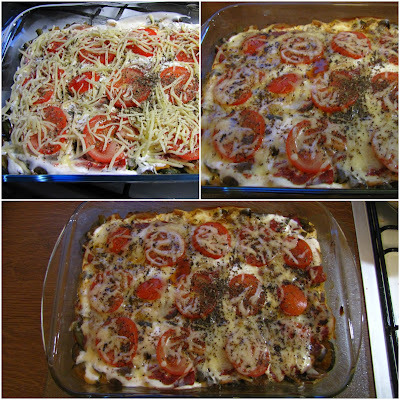 It's easy to make, you can take everything you have at home and some cheese topping and the oven do the job. On Thursday I had some Alsatian Tarte Flambee. I took no pictures because after C. made the tart it disappeared in only a couple of minutes. But we finally watched the last five episodes of How I Met Your Mother in English and made a small English-tandem using English for the most of the evening instead of German. I think we made progress with the language! So thanks for the nice evening. Today we went for some shopping to Sprendlingen-Dreieich and imagine what? I bought 24 wine and sparkling wine glasses. It had to be bought. I'm giving a birthday party in a few days - the first one since I stopped celebrating my birthdays 10 years ago. And I invited a couple of friends and I had not enough of usable wine glasses! The dish washer killed them all over the years. So I threw away all the old and replaced them with the new ones. Yes, my birthday... It's a topic for itself but I am not going to discuss it here. I think it's nice to start celebrating it again and because of all the friends and nice people it will be a pleasure to cook for so much people. I'll be a very busy guy that day. My flat is big for a single person but not big enough to invite more than 8 people if I want everyone to have a place at the table. So I split the celebrating into a city-celebration and a home-celebration. First of all I am meeting with some friends in the city at noon to visit a museum and go for a coffee. Later I am running home to drink some coffee and eat some cake with my granny (her question and biggest problem today was: CHRIS! What kind of cake are you baking???). God knows how many birthdays I will celebrate with her. I appreciate the time we're spending together - especially now after I got the message that my father's mom passed away on Friday. This are moments I stop for a while and start thinking about the circle of life. We should be prepared to die from the very moment we were born but when it comes, we're never ready. I still did not decide what to cook and bake for my birthday party at home I am having in the evening but I am sure I will have some ideas in the next two days. BUT I bought wine (a lot of wine) and some sparkling wine. I am sure we will have a nice evening. Tatjana and Sebastian offered to prepare some games so I am very thankful for that. Since two days I am cleaning the flat and making some decorations for the party. The afternoon sun today was shining into my flat and I LOVED it. It was the first time since two weeks we had some sun. As you can see it started snowing, so I really have the feeling my birthday and Christmas are coming soon soon. 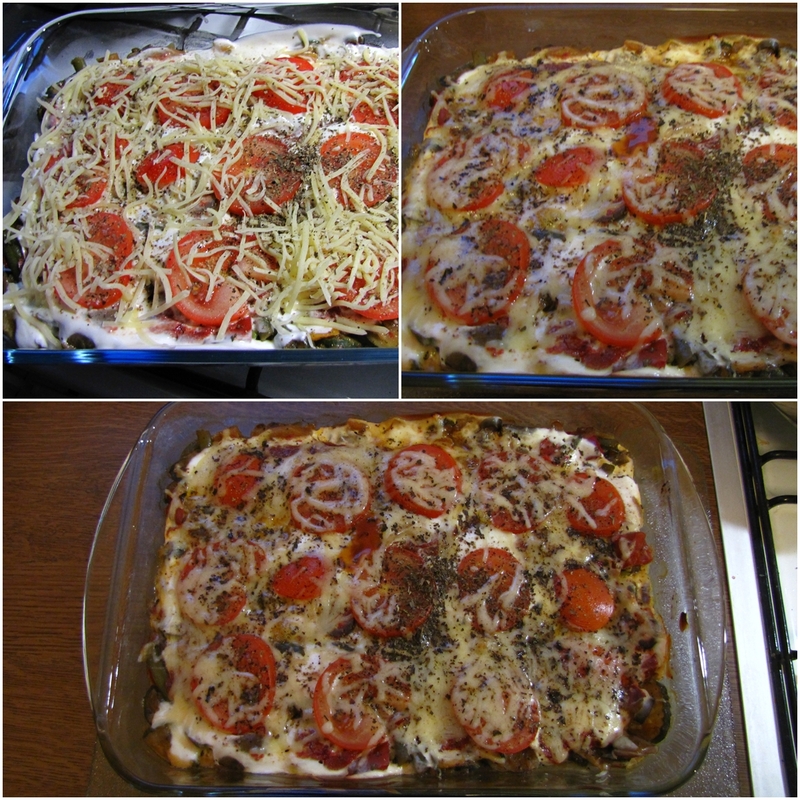 I made some vegetarian casserole yesterday, using bread at the bottom and covering it with vegetables, tomatoes and cheese and using yogurt instead of tomato-sauce. 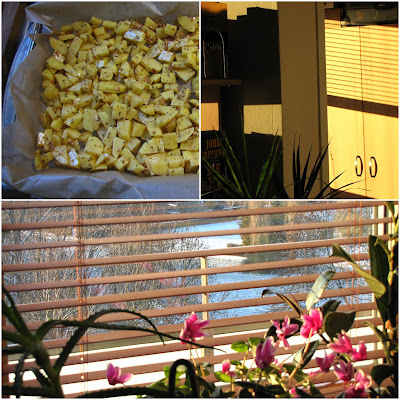 Today I made some potato wedges before we left for shopping.